As with any British army, that which sailed for the Crimea in 1854 included a number of Scottish regiments. Of these the Highland regiments, or at least those that wore full bonnet and kilt, were the most distinctive, and the most enduring image of these troops is the famous 'thin red line' of the 93rd (Sutherland Highlanders) facing Russian cavalry at Balaclava. With this incident in mind Strelets have created this set, allowing one of the most famous moments in that most dramatic of battles to be realised in 1/72 scale plastic. As always the widest possible range of poses graces this set, but on this occasion at least Strelets have tempered their usual penchant for over-dramatic poses and instead supply a good selection of really useful figures. The two falling casualty figures are the most lively, but that is perfectly appropriate and in fact these are some of the pick of the crop, along with the officer figure standing next to the flag in our scan. All the usual poses are here, as well as some more unusual ones like the soldier shaking is fist. There is even someone using his rifle as a club, and for once the pose is fairly realistically done. For accuracy we again found ourselves impressed with this set. The Highlander's uniform is pretty well documented, and has been faithfully reproduced here. Some of the men wear the Glengarry (which was worn by the 93rd but not the 42nd) rather than the feather bonnet, which we understand reflects the hasty turnout of these men at Balaclava. 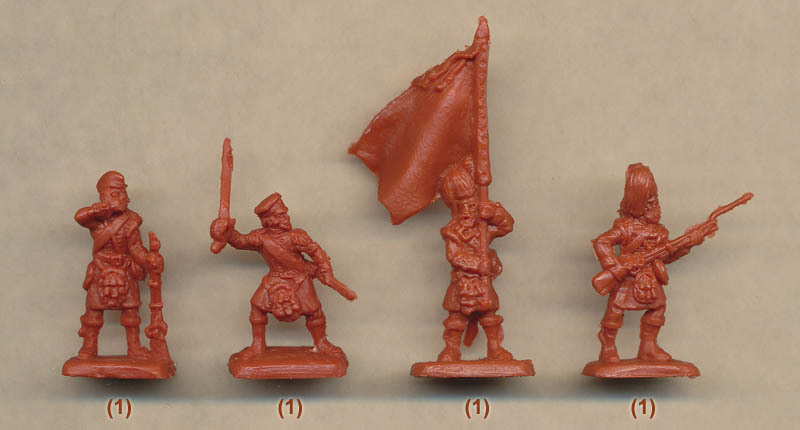 The pipers should have swords (and dirks), though it is not easy to see if these figures have them. Most do not have knapsacks, which seems reasonable for troops that basically spent most of their time in static siege work. 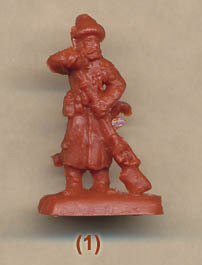 All wear the sporran, as they should, and while the feathered bonnet is always very difficult to achieve in plastic, here the results are about as close as could be hoped. The men all wear the single cross-belt and the waist belt, which is appropriate. The level of detail is good, but the sculpting, or at least the quality of the final figures, lets them down. The rather chunky style means these are not elegant models, and in places a close inspection reveals some unattractive details. For example, the otherwise exemplary flag-bearer appears to have lost all his neck and has his mouth below his shoulders. When arrayed on a table and viewed at arms length this is not apparent, and for some that will be all that is required. Strelets say this was a problem during the making of the mould, and not in the sculpting, although whatever the cause the result is still disappointing. Once removed from the sprue (a significant task in itself), these figures have no flash to trim, and the bases are nice and flat. By restraining their choice of poses and ensuring their accuracy, Strelets have delivered a very fine set that could form the basis of many colonial campaigns in addition to the Crimean War.